Sprinkles and white chocolate mixed together in a soft and chewy bar cookie? It’s a delicious combo! This recipe comes from our cute friend Shelly who blogs over at CookiesandCups.com. 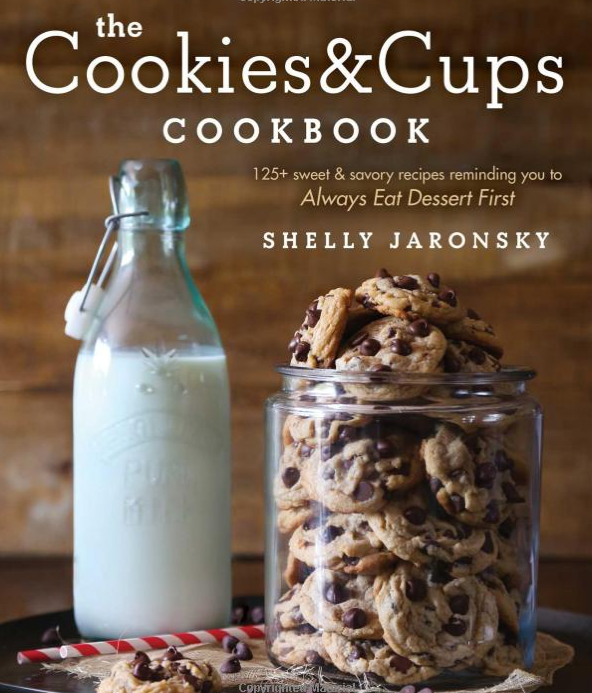 She just released her cookbook, The Cookies and Cups Cookbook, which is loaded with over 125 sweet and savory recipes. Shelly runs one of the best food blogs in the world, filled with some of the most amazing desserts (she has other recipes too, but her desserts are ah-maz-ing!). Every single one of her recipes leaves me drooling and this cookbook will quickly become a favorite because of all the tried-and-true recipes. Each recipe also includes a gorgeous picture, which makes the book even more drool-worthy . . . This book includes so many recipes that you will want to try, including Salted Caramel Chocolate Chip Cookie Bars, Billionaire Cookie Dough Cake, and every frosting recipe you will ever need. 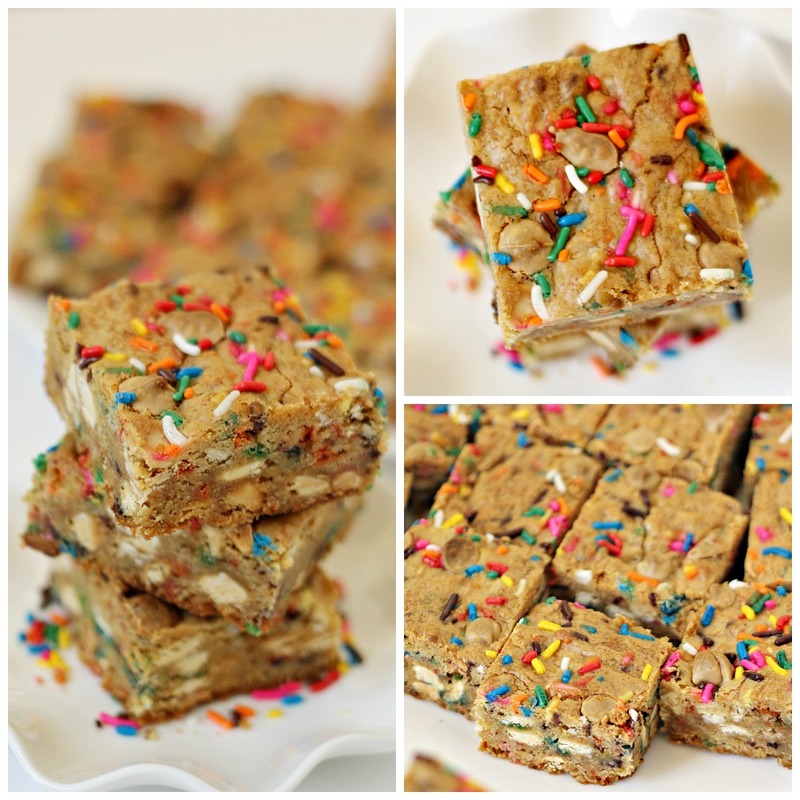 You will want to get your hands on this book (and these cookie bars!)! Preheat oven to 350 degrees F. Line an 8x8" baking pan with foil and spray with non-stick cooking spray. In the bowl of a stand mixer fitted with the paddle attachment, mix the butter and brown sugar on medium speed for 2 minutes. Add the egg, vanilla, baking powder, and salt and continue mixing for 1 minute, scraping the sides of the bowl as necessary. Turn the speed to low and add the flour, mixing until just combined. Stir in the white chocolate chips and 1/2 cup sprinkles until evenly incorporated. Press the dough into the prepared pan, top with the additional 2 tablespoons of sprinkles, and bake for 20-25 minutes, until the edges are lightly golden brown. Allow to cool in the pan on a wire rack. Cut into bars when you're ready to serve. Thank you so much for the sweet review!!! These looks so great and are a favorite recipe of mine from the book! These came out great! I made them for my daughter who is coming home today from U of Michigan. She loves sprinkles! Thank you! And thank you to Shelly for sharing the recipe from her cookbook!